Vegan? And delicious? Wait a minute...who am I? It's summer and it's that time of the year to eat healthier to get that bikini body that I so desperately want. What better way to check out one of the most popular vegan restaurants Café Gratitude here in Southern California. 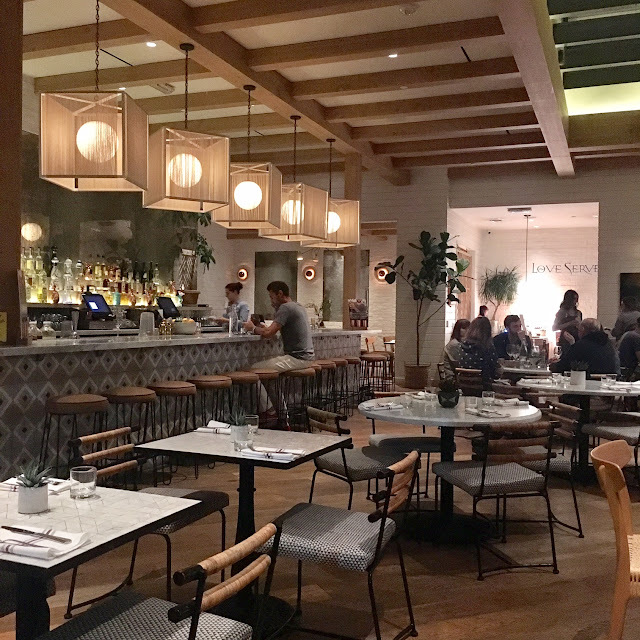 Café Gratitude is a vegan restaurant that is 100% plant based offering food that is vamped up and sophisticated to the palate. The ingredients are organic and the food, well, for vegan, is pretty spectacular. The restaurant makes all the "creams" and sauces in-house and they're amazing considering that there is not even one drop of dairy present. It's definitely a change from a person who has always been a carnivore, but in a good way. The interior is as sophisticated as the food. There is a large bar area with both indoor and outdoor seating for diners. Positive quotes are seen throughout the restaurant to make sure you love yourself with the food you eat. INTUITIVE-POMME FRITES ($10.00): Heirloom Potato Fries, Smoked Salt, Gremolata, Spicy Cashew Aioli or Chipotle Ketchup. I actually did not like this at all. I was thinking it was going to be crispy, and instead, we got a soggy mess. The texture was way off. I wish we ordered something else for an appetizer. COOL-MINERALIZING MINT CHOCOLATE CHIP SHAKE ($10.00): Cashew Coconut Ice Cream, Mint, Cacao Nibs, Almond Milk, Chlorophyll. I hated this shake. It was not good at all. I love mint chocolate chip ice cream and thought it would taste like that, but it was nothing similar to it. I get it. It's supposed to be healthy and it tasted healthy. I've had vegan mint chocolate chip shakes at other places that were amazing and this fails to bring that guilty pleasure to life. Plus, for $10, it was quite expensive. MY FAVORITE DISH. STUNNING-FOREST BERRY MERINGATA ($10.00): Aquafaba Meringue, Strawberry Raspberry Reduction, Coconut Cashew Cream. To think that this dessert has zero dairy in it is pretty amazing. It was absolutely delicious and I even forgot that it was completely vegan. The cream was rich with the perfect consistency and the meringue was light, fluffy with a perfect amount of crunch. There was the perfect amount of sweetness balanced by the fruits to give it some tartness. Delicious! WARM HEARTED-GRILLED POLENTA ($16.00): Mushroom Ragu, Arugula, Cashew Ricotta, Brazil Nut Parmesan, Basil. The polenta was so crispy that I thought it was fried. I loved that it held to its own dish and the dish came well together with the pesto sauce and "cream" that was used as the topping. It was a good dish overall. ELATED-MOLE ABUELITA ENCHILADAS ($16.00): Black Beans, Grilled Portobello Mushroom, Braised Butternut Squash, Cashew Queso Fresco, Avocado, Coleslaw, Escabeche. This was my favorite entree of the two. The enchilada was creamy and smoky with a slight spiciness to it. I could do without the pickled vegetables but I appreciated the cole slaw to offer a freshness to the dish. It was so good that I was suprised there was not even an ounce of meat in the enchilada. You actually don't miss it when the flavors were this good. Overall, I really enjoyed my experience at Cafe Gratitude, even if it was a vegan restaurant. I appreciated the effort the restaurant puts in producing vegan ingredients and was definitely surprised at how prominent the flavors are. I didn't love everything, but I definitely was pleasantly taken back with some. I like how they put positive words for the menu and the decor made it seem like you were in a really cool and collected nice restaurant versus a cheap, casual restaurant. I went to this place in first time with my husband on Tuesday night after work. The inside of Chicago event space was quit big and had enough seats to sit and nice bar area. We had a few things, along with drinks and it was all good!